The festive event follows the success of Fraserburghs Super Saturday. A new group has been launched to organise a weekend full of festive activities in Fraserburgh featuring an ice rink, sparkling Christmas and food events. The Rotary Club of Fraserburgh has created a sub committee, Festive Frozen Fraserburgh, which will work in partnership with Super SuperSaturdays, local business, Fraserburgh Lifeboat, Fraserburgh Development Trust, North East Scotland College and Police Scotland Youth Volunteers. At its first meeting it was agreed to organise several fund raising events, including a summer Big Broch BBQ, including a a sponsored beach walk and family picnic, an autumn tartan ceilidh and winter Broch’s Got Talent, to help collect enough money to hold a weekend long festive event. 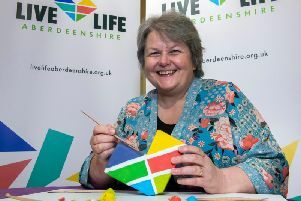 Ann Bell MBE, Fraserburgh Rotary President Elect, said she was delighted with the attendance, and she looked forward to whole community working together to ensure that Fraserburgh had the best Festive Frozen Fraserburgh event ever. She added that this will build on the excellent late night shopping events and amazing SuperSaturdays. Leona Findlay, Super Saturday’s co-ordinator, said: “Super Saturday’s last event of 2016 was a great success. “The event was held the week after the town’s late night shopping but this year we have decided to join forces with the Rotary and local business owners in order to join the two events and deliver a bigger and better weekend long event at the end of the year featuring an ice skating rink. “We hope the event will continue to keep the heart of our town centre beating and keep the town on the map following on from the renowned success of the Super Saturdays. It will showcase what the Broch has to offer and that we don’t have to travel far to spend a fortune on a family day out. It can all be right on our doorstep! Leona said they can only move forward with the full support, help and financial generosity of local businesses, groups and individuals.